He's not going to win a roller-derby, but a new Japanese robot can skate around your lobby keeping an eye on things. If you've played the original Deus Ex, you'll probably remember the NSF security droid, a bullet-proof robot armed with twin machine guns. This little fellow, called EMIEW2, isn't quite as formidable, but he can do something that that gun-toting death machine can't: He can roller-skate. 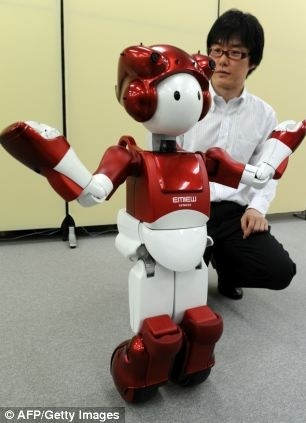 EMIEW2 was created by Hitachi, and has shock absorbers built into its legs that allows it to cross obstacles like wires and uneven floors without tripping up, something that the manufacturer claims is a first for a robot of its kind. "It can control its posture the way humans do when we stabilise ourselves after jumping on inline skates," said Yuji Hosoda, chief researcher at Hitachi's transportation systems department, at the robot's launch. EMIEW2 is around 32 inches tall, and has a top speed of 3.7 miles per hour, around the same as a brisk walking pace. There are 14 microphones built into its helmet, which allows it differentiate between human speech and background noise. Hosado believes that EMIEW2 could be used as a receptionist or tour guide, or take a role in security. "It could also be used for security, such as patrolling and surveillance as it could find a suspicious person hiding in blind spots out of range of fixed security cameras," he said. "This adorable EMIEW could lead to a new form of surveillance."